So it begins! 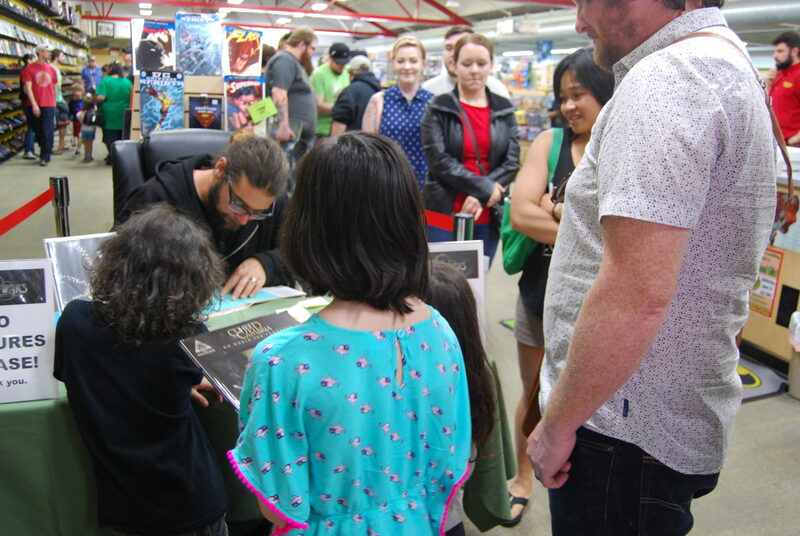 Claudio Sanchez signs autographs at Source Comics and Games. If you are not very familiar with the band Coheed and Cambria, you might not know that their albums tell a story also chronicled in The Amory Wars—comic books published by Evil Ink Comics and set in Heaven’s Fence, a collection of 78 planets connected by light beams known as the Keywork. The story follows the characters Coheed and Cambria Kilgannon, and later their son Claudio Kilgannon, as they war against the Supreme Tri-Mage Wilhelm Ryan, who is intent on destroying Heaven’s Fence. The stories are twisted and make you question which decision is truly the right one when faced with impossible and deadly choices. 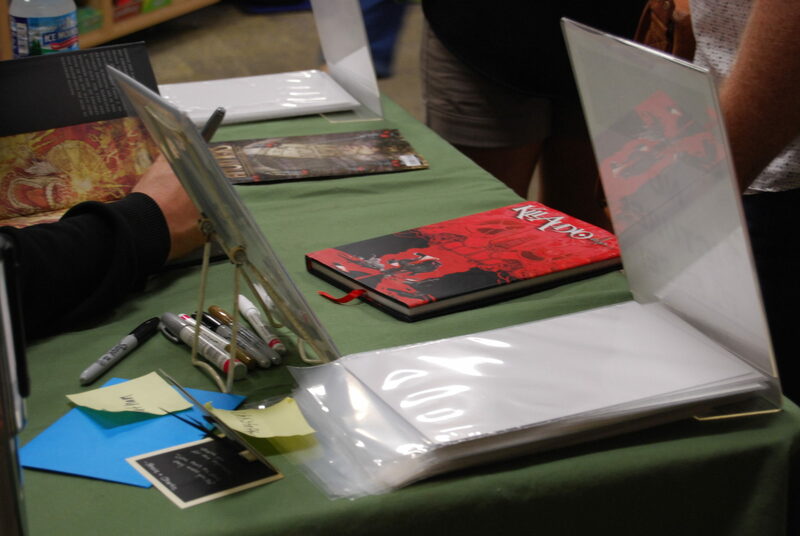 While the band was stopping through Minneapolis on its Neverender: GAIBSIV tour for a very sold-out show at First Avenue, Coheed and Cambria frontman Claudio Sanchez made a trip out to Source Comics and Games to meet fans and autograph comics. 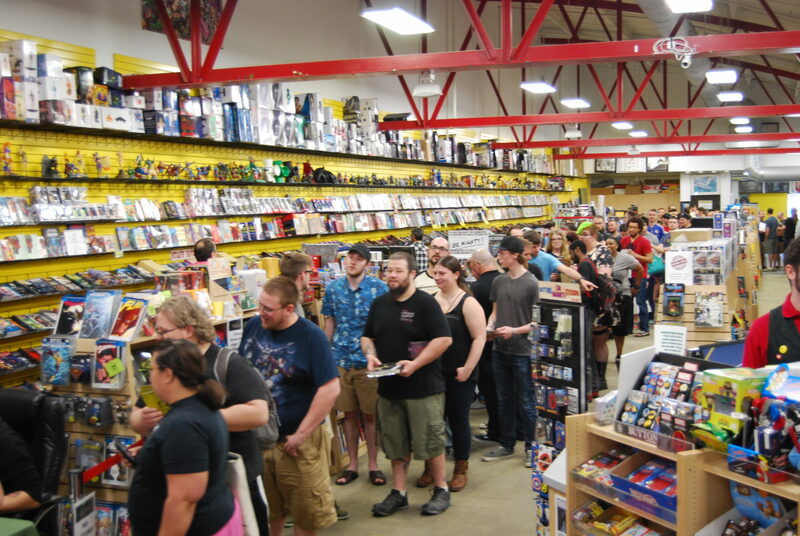 Coheed devotees lined up more than an hour before he was set to arrive for a chance to meet him and have their comics autographed. Meanwhile, at First Avenue, many people were lined up several hours before doors opened. Everyone was brimming with anticipation as they waited for Claudio to appear, where his entrance was met with cheers and excitement. As a fan of Claudio’s music and comics, I was excited to be able to interview him after the line of fans dwindled. We walked together as he shopped through the store, where we discussed his comics, theremin playing, and his creative process. The line of passionate fans wrapped around the whole store. Sherry Anisi (TCG): First, off I want to say thank you for your art and music! What is your comic-book origins story? Where did you start with comics? Claudio Sanchez: I think my comic-book origins story started with kiddie clothes. You know, sort of being dressed up in Superman or Hulk shirts. I remember a picture of my brother and I when we were toddlers, I think I was wearing an Incredible Hulk shirt and he was wearing a Superman shirt. It just kind of was in the culture. I think my dad had an interest in it and they bought a shirt and put it on us, so that’s kind of the beginning. For me actually reading comics, a friend of mine and I, when we were in third grade, decided to hit a comic shop on a Wednesday, and he purchased . . . I believe it was Grant Morrison’s Arkham Asylum. At the time we were collecting books, but that was the one that kind of blew me away, that a comic could actually look like that. And the other one was Mignola’s cover of Robin bleeding in A Death in the Family and seeing that sort of page—I was kind of blown away by that, like what could possibly be happening in a book like that? So those were two books that really kind of turned my head to getting into comic books. But you know, being a kid in the culture of the US . . .
TCG: It’s just around you. Claudio: Yeah, totally, it’s here. Watching Christopher Reeve as Superman probably had something to do with it. Claudio was all smiles as fans told him about their favorite Coheed and Cambria experiences. TCG: Where did the Amory Wars concept start? Claudio: Hmm, Amory Wars concept . . . as a songwriter, I was finding more songs that were embellishments of my life. I had a hard time being a vocalist—a lead singer—singing songs about me. So I thought I could take my life and embellish it, make it something more fantastic, more interesting for me to write. That’s kind of where The Amory Wars came from. Amory is actually the street I grew up on. Coheed and Cambria are loosely based on my mother and father. Some of the characters in the story are based after real people that have come in and out of my life; I play a character in the story. Kind of accidentally, because I ended up singing my name in a song [“Everything Evil”] and I guess I kind of had to make a character after. A fanmade canvas of Ambellina, one of the Prise, as her wings are burned. That was pretty much it; it was a way to tell my story without being so literal. From there, it made sense to me to make the comic books because at the time, when I started to really come up with the idea, I was working in a pet store and I spent the day daydreaming, and on my breaks I would visit this comic shop—it was Wizard World—across the street from where I worked, and that’s when I just started putting two and two together. If this ever did take off and became a real band, maybe I could do something where I cross over from the records to something on paper. TCG: It definitely took off! I loved the Year of the Black Rainbow novel. What was it like cowriting with Peter David? Claudio: It was great, actually—it was a learning experience. I learned a lot from Peter writing Year of the Black Rainbow and also on In Keeping Secrets. We cowrote it together. Here was a legend, kind of helping me understand the medium more than I did. And that was pretty much it. We became friends, and from there my wife and I decided, maybe with what we learned from Peter, we can take up the responsibilities ourselves. Kill Audio is another comic series by Claudio Sanchez and Chondra Echert. TCG: Was the project just passed back and forth when cowriting with Peter? Claudio: A little bit. I would give him what the story was about in the records, then we would go back and forth. He would create the skeleton of the script, and if certain characters didn’t sound right, I would kind of chime in. Especially with Year of the Black Rainbow, at the same time, we were writing the record, so doing both things at once could be a little trying. 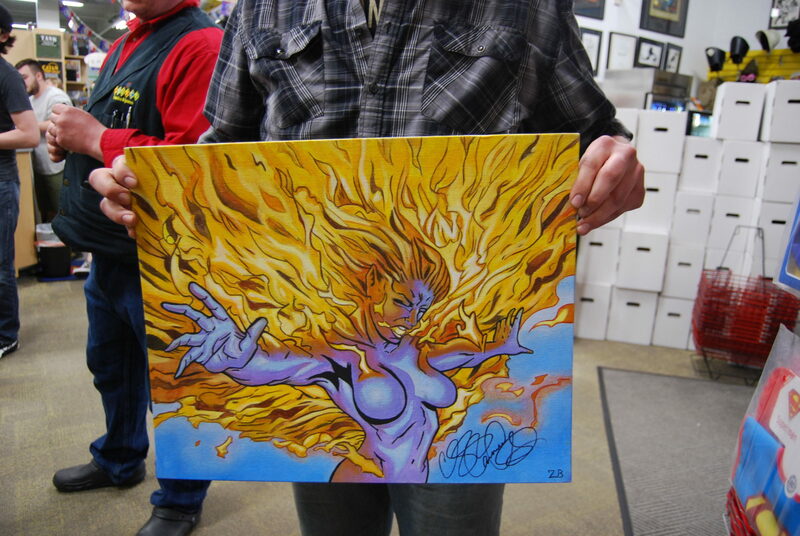 TCG: If you could write any comic property or superhero, what would you want to write? Claudio: You know, for me, I would love to do a Calendar Man story from Batman. I think that character, as kind of goofy as he is, I think there’s an opportunity to make him interesting. I’m a big fan of time, I’m a big fan of history repeating itself, and I think there’s a lot of potential in that character that’s just kind of being overlooked. That’s a character I would like to write for. As far as for a superhero, I kind of got into Green Lantern for a while and the Green Lantern Corps. I’m a science-fiction guy, so I feel like that would be a property that would make sense to me. TCG: What is it like writing music and lyrics compared to writing comics? Claudio: Writing lyrics, I can be as vague as I want to be, whereas comics I have to be pretty literal and clear to the artist who is translating it to paper. It’s funny, because when you’re writing a comic book, you’re writing it just for him [the artist]. Sure, there’s the dialogue that comes with the page, and that’s there for the readers, but for the most part you need to really communicate with your artist and find what works for you and him, or her. You just have to find a language between each other that makes sense. TCG: Several years ago I saw you play an incredible theremin solo. I did not know what it was, but now I own one. Do you have any advice for learning how to play the theremin? Claudio: Oh, really? [laughs] Don’t smoke and drink. Be as stiff as possible. TCG: Don’t move a muscle, got it. What drew you to learning to play the theremin? Claudio: Led Zeppelin! I’m also a big fan of synthesizers, so I always knew of the theremin, but then watching Jimmy Page sort of incorporate theremin into the live set really was just me mimicking that. I really like synthesis a lot, so I like gadgets that make bleeps and bloops. TCG: Bleeps and bloops are great! I don’t want to take up much more of your time as you’re shopping, so thank you so much for talking with me, and I’ll see you at the show tonight! Claudio: Cool, it was nice talking to you! Beaming parents pass on their love for Coheed. The Amory Wars is available from Evil Ink Comics and your local comic shop. You can learn more at coheedandcambria.com or by following @claudiopsanchez and @coheed on Twitter. Sherry is a music addict living in Minneapolis who plays the cello and pretends she can sing when she’s driving alone. She worships System of a Down, and her eclectic musical tastes range from classical to J-pop to death metal and everything in between.